BlessedLand Dragonfly Wind Chimes-4 Hollow Aluminum Tubes -Wind Bells and Dragonflies. Enjoy your own private symphony each time when the little wind blows with the beautifully soft sounds of BlessedLand Wind Chimes. Design 4 (4) durable bronze aluminum tubes, the longest tube 11 inches. Easy Installation - No Tools Required. Enjoy the excellent design,and beautiful sound of your very own patio wind chime by clicking 'Add to Cart' above. You and your family will love it! 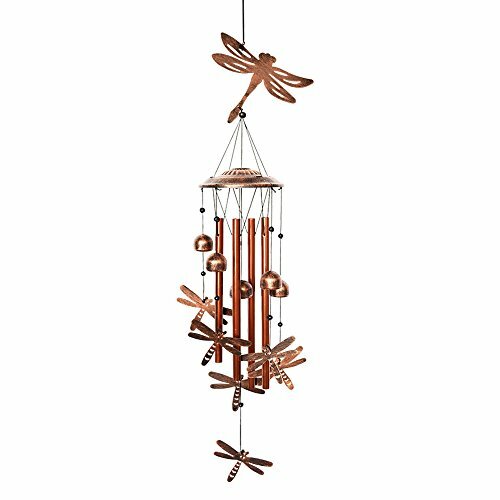 NOVEL DESIGN & WELL-MADE CONSTRUCTION-This wind chime consists of a metal Dragonfly top and 4 bronze-colored Aluminum hollow tubes, 6 bells and 6 small dragonflies,the longest tube is 11 inches. HOME DECOR- Perfect for the patio garden backyard anywhere you wish to add beautiful melodies to your environment and provides years of pleasure. A beautiful addition and necessary decoration for home. GREAT GIFT-The attractive design also makes it a great gift for your family members and friends. 100% MONEY REFUND GUARANTEE-enjoy your brand new chimes or your money back. We offer free new replacement or full refund if you are not fully satisfied with it. Beachcombers SS-BCS-03738 Burnt Flower Bamboo Chime, 37"